The weather has been kinda weird lately...it'll be really cold and then yesterday it was bordering 80 degrees, and today definitely was a mix of 50s..and then some 70s..and then 50s again. It's kind of hard to dress for weather that's so unstable...but also nice sometimes because you get to mix items that you normally wouldn't...like this cashmere sweater with this thin faux leather skirt. I actually just got this sweater, and am obsessed. I love the subtle hints of red from the front, and the change of colors from the front of the sweater to the back. I kept this outfit simple by wearing the color blocking sweater with some neutral tones, and then toting around this beautiful new Coach bag...which I'm quite impressed with. I haven't bought a bag from Coach in a good 8 years. The weather really needs to make up it's mind! It's driving me batty too. Today was the first day I stepped out without any jacket. I love your sweater and your new Coach bag is gorgeous. I didn't like Coach for a long time because they kept coming out with overly trendy prints, patterns when I think they became successful for their classic, signature styles. I'm glad they finally realized that people love the classics and came out with some styles that will speak to everyone. Right?! Yesterday was 50 and today is like 70. It's driving me crazy. Thanks so much!!!!!! Yeah, I totally agree. Coach definitely took a turn for a better by revamping their designs. I'd love to! Commented on your blog! I love this sweater, it's so cute. It looks great with the leather skirt. 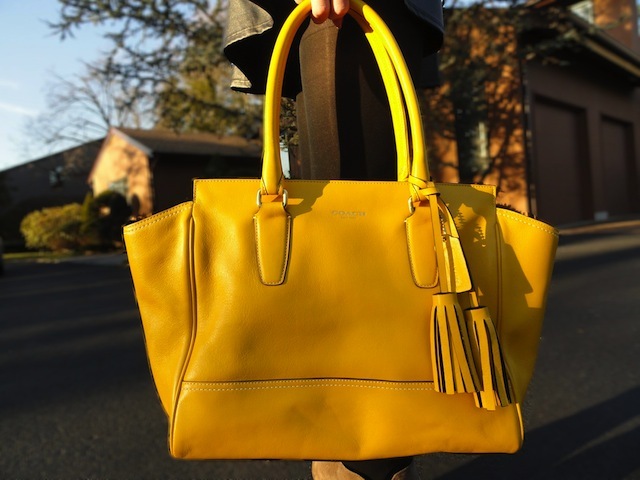 Adore that yellow bag! Thanks love!!! I love the bag too. Perfect yellow color to me! I haven't made a Coach purse purchase in sooo long but I am really enjoying what they have been doing lately with the bright colours. I like that they have moved away from throwing those "C"s on everything. Uh I definitely agree. It's gotten much classier since they've taken those C's out. Some of their spring/summer stuff is really cute! !